Look kids, Big Ben! Parliament! 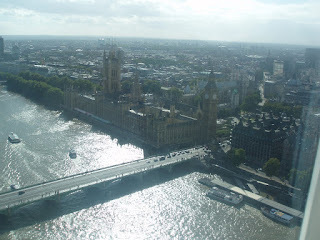 It was a lovely trip to London, dampened slightly by a little trouble with the immigration authorities at Schiphol when I tried to re-enter the Netherlands. They saw in their computer that I was once Dutch, but my passport has been revoked. Of course I wasn't traveling on the Dutch passport (I've already handed that over to immigration authorities), but on my U.S. passport; and I now have a valid Dutch immigrant work visa. 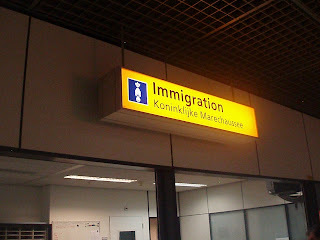 But they wanted me to turn in my Dutch passport. To recapitulate, I was supposed to turn it in at Amsterdam City Hall, but was refused by the bureaucrats there. I later handed it over at a very formal meeting with the IND (Dutch Immigration Service) at the Vreemdelingenpolitie (foreigner's police) office, conveniently located in a heavily immigrant neighborhood in the 'slums' along Amsterdam's outskirts. These are pretty nice slums compared to the French Banlieues, by the way, speaking as someone who has lived briefly in both. It really should have been noted in their computer system, since I could never have gotten the new visa without turning in the passport. Eventually something in my weary gaze, and/or the fact that my Dutch wife was with me and/or that our son was uh, impatient, convinced him just to make photocopies of my documents and let us through. 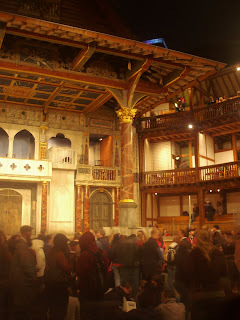 We saw the "Merchant of Venice" at the Globe Theater (Theatre) along the Thames. Possibly the best Shakespeare production I've ever been to. I tried to get a bit of the atmosphere in the photo _ the theater has an open roof (night photography is difficult!). At the start of the show, Lancelot Gobbo (the clown) comes out and looks sullenly at the crowd, addressing first the people with seats and then those with standing room only tickets ('groundlings'), pointing at us with a half-eaten chicken bone: "Ladies and Gentlemen _ and the POOR _ please turn off your futuristic ringing and picture making devices. We're sorry, but you didn't pass your exam to get a Duch visa.